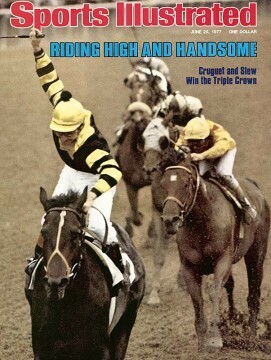 Seattle Slew’s website calls him “Thoroughbred Racing’s Greatest Champion.” So War Eagle to that. I’m not a horse racing expert. I’m the opposite of an expert. Besides Secretariat—because there was that movie about him and everything—I know the names of three racehorses, current and former. And the only reason I know their names are because of their connection to Auburn, however slight. A year or so ago we learned about Toomer’s Corner, a three-year-old Bay Filly (whatever that is— I guess some kind of a horse) owned by a yankee who only discovered the significance of his horse’s name when news of the poisoning of the Toomer’s Oaks reached New Jersey. A few weeks back we reported that the name of a horse running in the Preakness on Saturday, Tiger Walk, was a wink toward the Plains; his owner is Under Armour CEO and trillionaire friend of Auburn Kevin Plank. But the reason I knew about the first racehorse I ever associated with Auburn wasn’t because he had some Auburn-y name, it was because he was owned by Auburn grads. By itself, that doesn’t sound so special—plenty of people have owned plenty of racehorses, and I’m sure plenty were probably Auburn grads. But only a few folks owned Seattle Slew, one of the greatest racehorses ever (there’s a documentary and everything), and they definitely were Auburn grads. Or at least two of them were (there were four altogether), husband and wife Jim and Sally Jones Hill, who met at Auburn in the early 60s. Jim was a vet student and rodeo rider. Sally was the niece of some famous harness racing jockey. The both grew up around horses. The became pals with Karen and Mickey Taylor who in the early 70s had just decided to get into horse racing. Jim became their vet. When he saw Slew for the first time, he reportedly remarked: “If this isn’t a race horse, my name isn’t Jim Hill.” His name is Jim Hill. They bought Seattle Slew together. The rest is thoroughbred history. The Kentucky Derby. The Preakness. 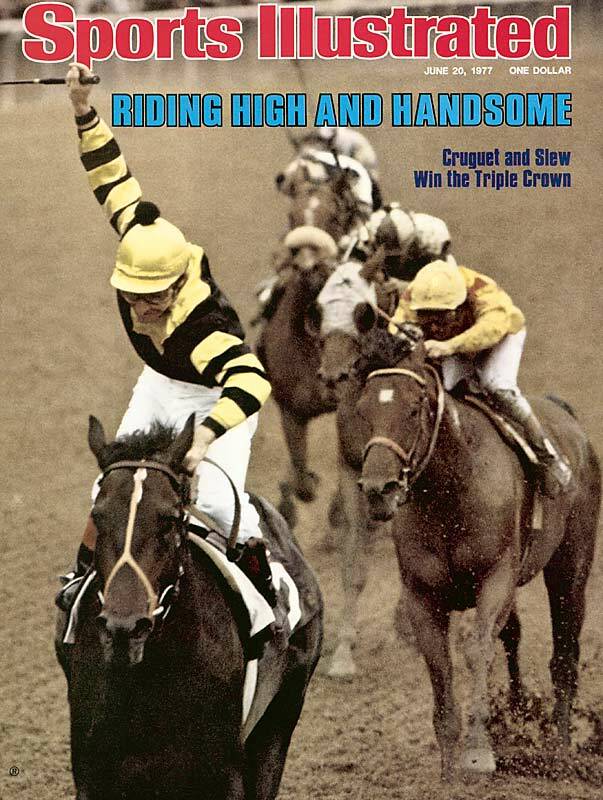 Belmont Stakes—in 1977, Seattle Slew won’em all, the Triple Crown, the tenth of eleven horses to do so, and he remains the only one to ever do it undefeated. And it probably wouldn’t have happened had Jim Hill not graduated from Auburn, which taught him to be a leg man. Seattle Slew’s great-grandsire gettin’ his health on in Auburn, 1970. Want more of an Auburn connection? 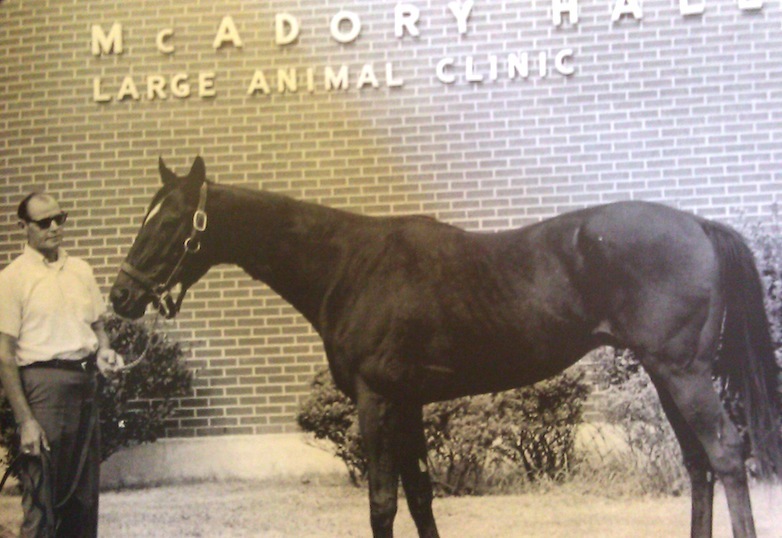 In 1970, Auburn’s Vet School treated Seattle Slews great-grandfather, Bold Ruler, for a malignant tumor (Bold Ruler also happened to sire that Secretariat horse. I just learned that. So I now know five horses). Seattle Slew co-owner, Sally Jones Hill, at Auburn in 1963. 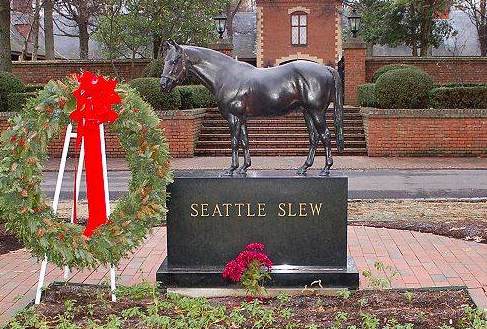 Oh, and if that wasn’t enough, Seattle Slew was born on Feb. 15, 1974. You know what happened that day. And there’s just no way it’s a coincidence. If you’d like to help TWER uncover more secret connections between Auburn and legendary racehorses, click here. A bay is a reddish-brown or Auburn-colored female (filly)…..perfect. Seattle slews sire was Bold Reasoning, also owned by auburn folks Frank and Martha Ann Heard of pine mountain, ga. Parents of my dear friend Karen Heard, another auburn student. Charismatic, Ky Derby winner & Preakness winner was bred at Parrish Hill Farm, Midway,Ky — daughter Amanda Roach Cole, graduate of Auburn, AOPi, Camp War Eagle counselor, etc. brother to Charasmatic, Millenium Wind also of Parrish Hill. Many other eclipse award winners, Horse of the Year, Breeders Cup, etc. Amanda’s love for Auburn inspired two cousins to also attend Auburn- currently. great history lesson..enjoyed the triple crown auburn relationship! war eagle!